Busy mornings made easy. 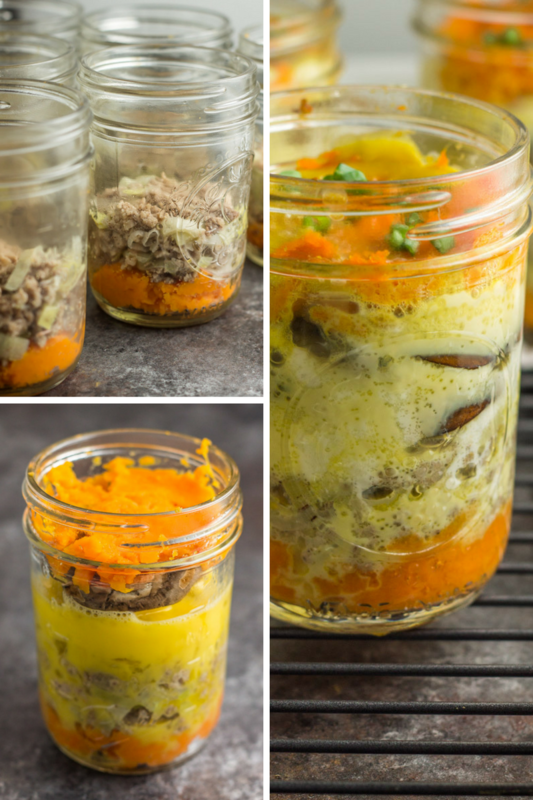 This paleo and Whole30 mason jar sweet potato ground turkey scramble is the perfect grab-and-go breakfast you can make beforehand and reheat in a flash. 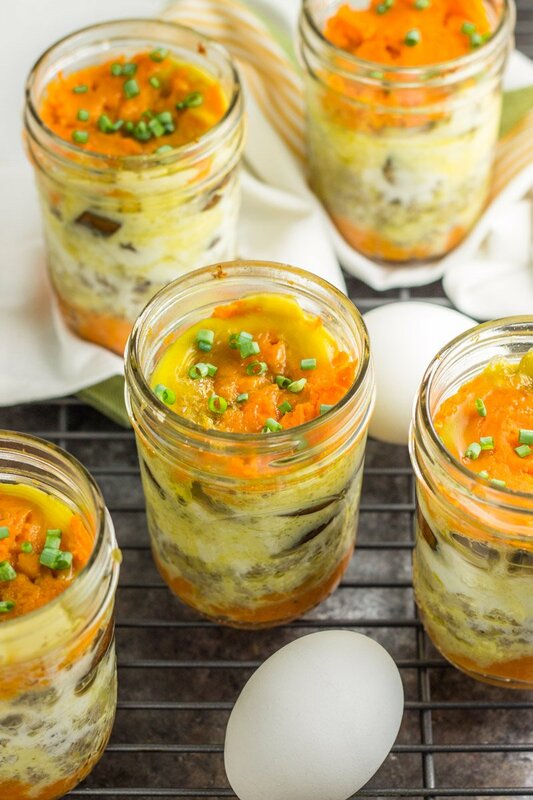 Packed with protein and complex carbs, this mason jar breakfast will keep you fueled all morning long. 5:45 am should be meant for sleeping, not for jumping out of bed like a cheetah straight from REM sleep. 6:30am should be meant for casually sipping coffee and frying a few eggs with the smell of bacon seducing your senses, not scrambling to get a healthy breakfast in front of hangry little people. 7am should be meant for catching up on the news or causally scrolling through Instagram, not for cleaning up accidents or blowouts. I love being a mom. I LOVE IT. But I don’t love mom mornings. There, I said it. Mornings in my house are always a little chaotic, and when you aren’t a morning person and have boat-load of responsibilities before the sun is even up, it’s hard. One kid wakes up WAY too early, demanding breakfast and Paw Patrol and slippers because his feet are cold and help at the potty. All while you’re trying to keep him quiet so he doesn’t wake up the other one. Then almost always tripping over a few trains scattered on the floor and frantically try to figure out breakfast before the baby is up and needs a diaper change and food for himself too. It’s divine intervention if you have time to make a pot of coffee, and you’re grateful if you get that first sip in before 8am. Ok, not that I’ve got that off my chest, let’s just say these mason jar sweet potato ground turkey scramble breakfasts are giving me LIFE. A few steps go in to making these mason jar beauties, but the end result is well worth the effort. 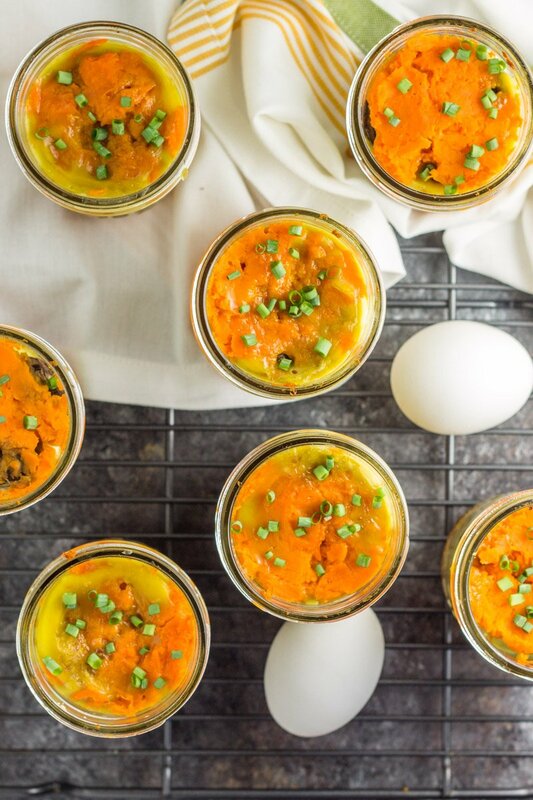 When you’re feeling bored with your breakfast routine, or in dire need of something quick and easy, these mason jar sweet potato ground turkey scramble breakfasts will save your booty and fuel you all morning. Need other easy, grab-and-eat breakfast ideas? 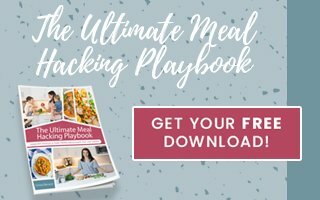 Try these allergy friendly blueberry chia vanilla breakfast cookies, these healthy breakfast banana boats, paleo pizza egg cups, and of course this post for 5 portable paleo breakfast ideas. Can’t wait to make these! For us non-mushroom eaters, is there any reason for the mushrooms’ existence (e.g. to aid in the cooking process of the eggs) other than an extra veggie component? It’s really nice to see a breakfast in a mason jar that isn’t overnight oats. Can’t wait to try this one! Love love this and am totally in the same boat as you! Any thoughts on how the morning magic might happen without a microwave? Toaster oven or back in your regular oven at 275 until heated through again will work! thank you so much for your recipes!! Super excited to try this! I don’t like mushroom 🙁 What can I substitute with? You could omit completely but the mushrooms act a a barrier so the sweet potatoes on the top don’t sink in to the eggs. So anything else you like that would do the same job! Great idea! I have an intolerance to eggs, so I’m omitting them as part of my Whole 30. Are heating instructions the same without eggs? Yep! Should be the exact same. Hello! What size jars do you use? Sorry about that! 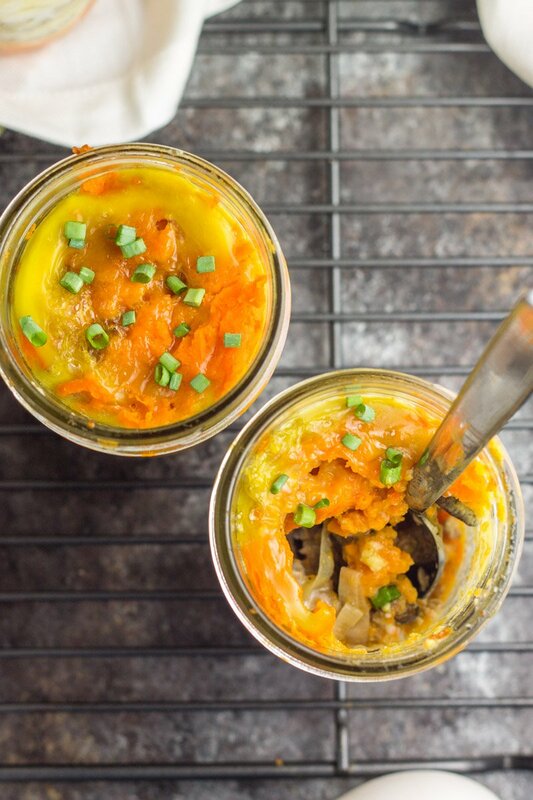 Half pint sized jars! Shelf life for these in the fridge and freezer? Brought here from the whole30 insta story – super excited about these! I haven’t tried freezing them, but they should stay in the refrigerator for a week! Just saw this on instagram yesterday and would love to try it! Just wanted to confirm–are those 8oz mason jars? I have all the supplies ready to go–my mornings are just as hectic and my kids are 6 and 10. I wish I could tell ya it gets easier! I have to hand wash my jars with a sponge to get all that egg out! UGH NOOOO! I’m so sorry!!! I’ve never had that issue, DANG I hope others don’t have the same issue. I do know some readers have done this exact recipe in casserole dishes with great success. This is a great recipe! 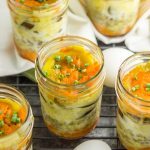 I use a casserole dish instead of the mason jars but layer the same and it works great. Thanks for a great breakfast dish! YAY I’m so glad you like it Molly! I didn’t have the smaller mason jars and used the 12 oz-ers to see what would happen. 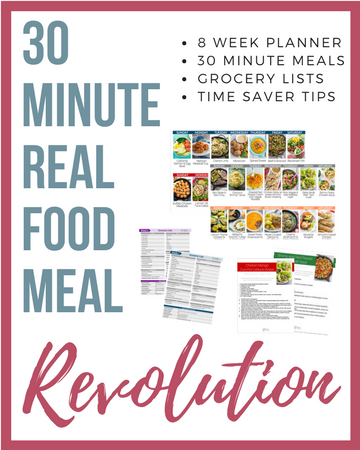 I just cooked it about 7-8 minutes longer and it worked perfect! Thanks for the feedback Katie! Very helpful!